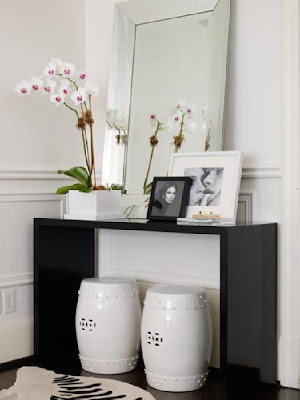 Entry tables are often one of the first statements people see when they come into your home. They are the first to shout "This is my style!" so it's important to make them design worthy and not just a catchall for your keys and mail. Here are a few ways to easily accessorize to your table and give your guests a nice welcome to your home. If you're normally afraid to use color in your home, the entry way is a great place to overcome your fear. 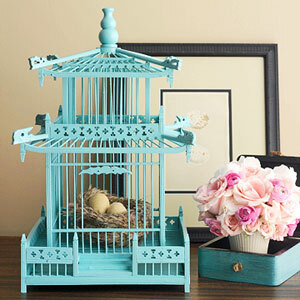 Whether it's through a teal birdcage or pink bouquet of flowers, you can easily add some cheerfulness to your home without overwhelming yourself or your guests. Candlesticks. Candlesticks. Candlesticks. I think you can never have enough. 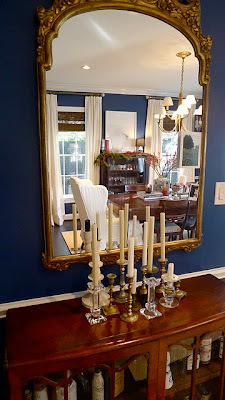 Grouping them, in this case antique ones, makes a great statement with little effort. It's a great way to add a little character too. When accessorizing your table, don't forget about the space underneath. This is a great place to add extra seating and interest without sacrificing valuable square footage. 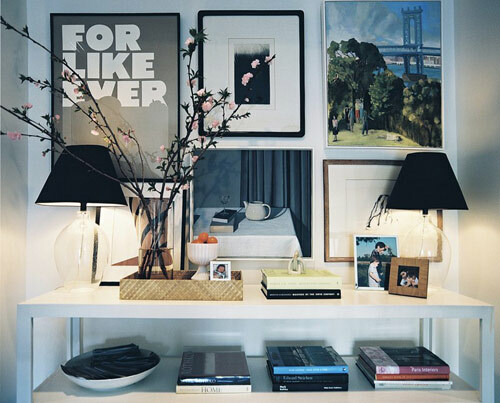 Adding a grouping of artwork over your table is a great way to bring your personality to the space and capture guests' attention as soon as they walk into your home. 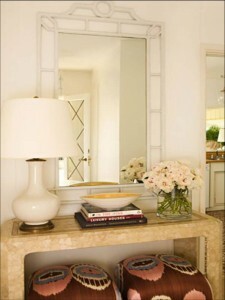 Flanking each side of your table with matching lamps adds symmetry, balance and a nice glow. The woven tray helps multiple accessories function as one piece, so they aren't overwhelming to eye. Keeping it simple is just as powerful. There are only three groupings below (again, a balanced space), and yet it still has a great impact. Adding a mirror reflects more light around the room and allows you to get one last "face check" before you leave your home.